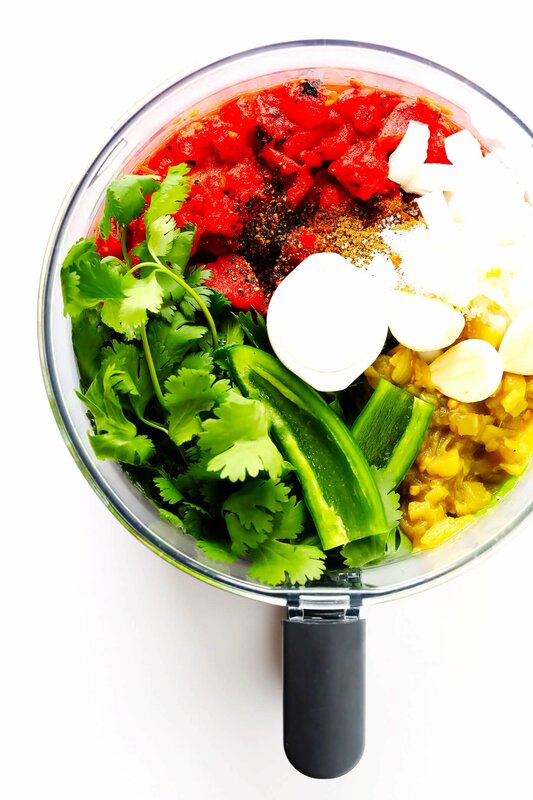 This Restaurant-Style Salsa recipe only takes about 10 minutes to make, it’s easy to customize (to make it extra spicy, smoky or tangy if you’d like), and it’s SO irresistibly delicious. Which also means…happy birthday to me! Last year for my birthday, I had all of my friends over for an epic chips-and-salsa-a-thon, which was downright dreamy. Instead of cooking, Barclay and I drove around town all afternoon and picked up a dozen or so different salsas from our favorite Mexican restaurants. And then we whipped up an enormous batch of my classic margaritas, opened up a zillion bags of chips, and had all of our friends over for the most delicious taste test ever. Totally my kind of birthday. This year’s plans are TBD, thanks to my sweet fiancé who knows how much I love a good surprise. But I did go ahead and whip up a batch of this salsa recipe to have on hand for my bday and Cinco De Mayo this week, which I’ve already been putting to good use. And hey — since I don’t eat many sweets or crave a traditional birthday cake anymore — this seemed like my kind of birthday treat recipe to share on the blog today. ? Alright, so about this salsa recipe! It’s actually one that I shared on the blog a few years ago. But — like many of the recipes around here lately while I’ve been busy with wedding planning — it’s one that I recently re-photographed and updated to share with those of you who might have missed it the first time around, because I’m convinced that everyone needs this recipe in their lives. 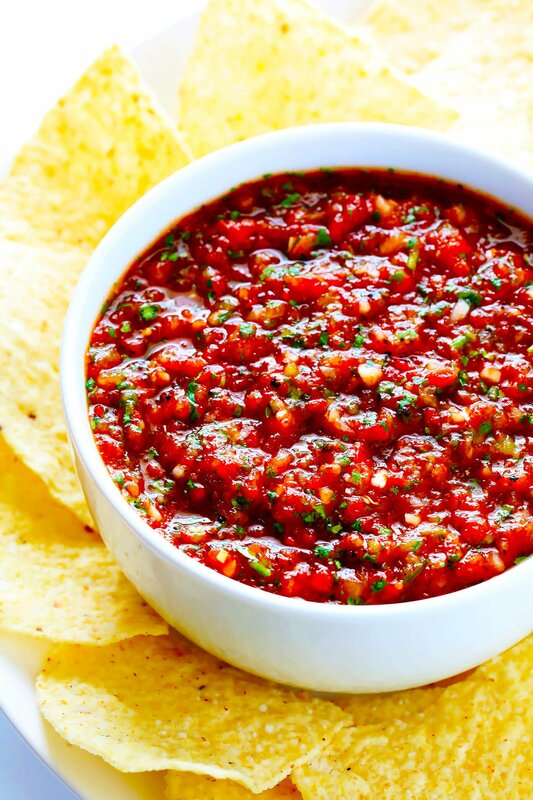 Seriously, it’s been my go-to homemade salsa recipe for years. 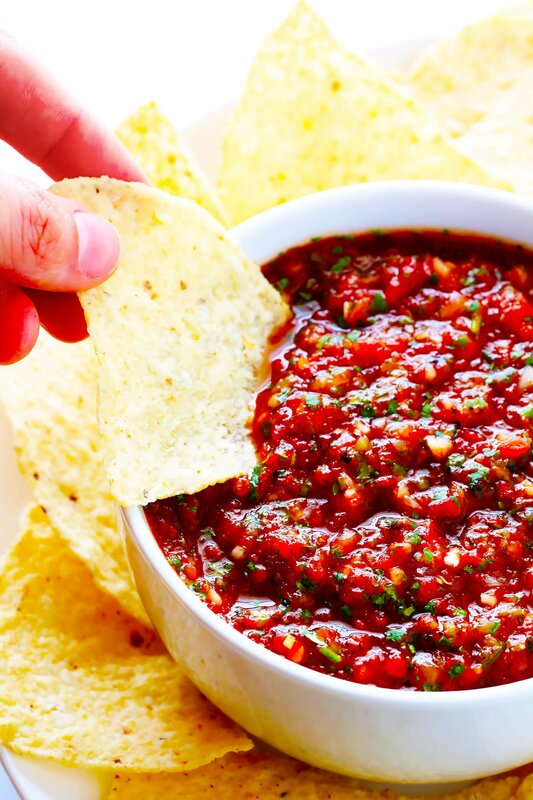 And for someone who makes homemade salsa nearly once a week, that’s sayin’ something. But the best part? It’s incredibly quick and easy to make! Also, since it uses canned fire-roasted tomatoes (gotta use the fire-roasted), it’s a really accessible recipe to make year-round, even beyond your regional tomato season. …then taste and season as needed. If you’d like a smokier salsa, I strongly recommend adding in a chipotle pepper or two in adobo sauce. If you’d like a spicier salsa, you can add in an extra jalapeño (or just add in the seeds from the original one). If you’d like a tangier salsa, you can’t go wrong with extra lime juice in my opinion. And as always, don’t be afraid to add in extra salt to kick up the flavor if needed! 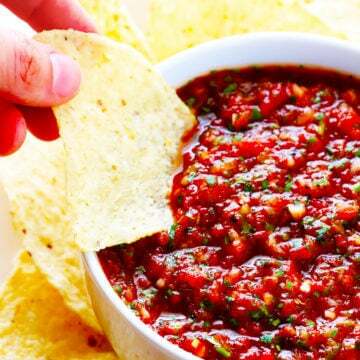 Then, once your salsa is all seasoned and ready to go, partay like it’s yo birthday and DIVE IN. Seriously, I’ve made this recipe probably hundreds of times, and still never grow tired of it. So if you need some chips and salsa in your life this week — as I believe everyone always does — I can’t recommend it enough. 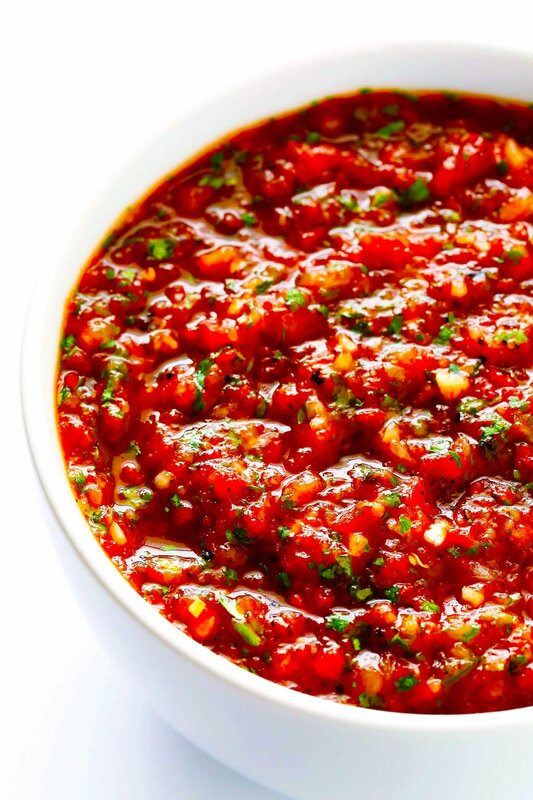 This restaurant-style salsa recipe is easy to make, and full of amazing fresh flavor. 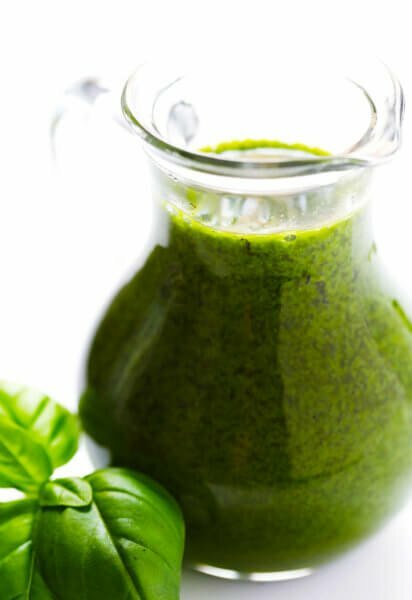 Pulse all ingredients together in a food processor or blender until smooth, or your desired consistency is reached. Season with additional salt and pepper if needed. 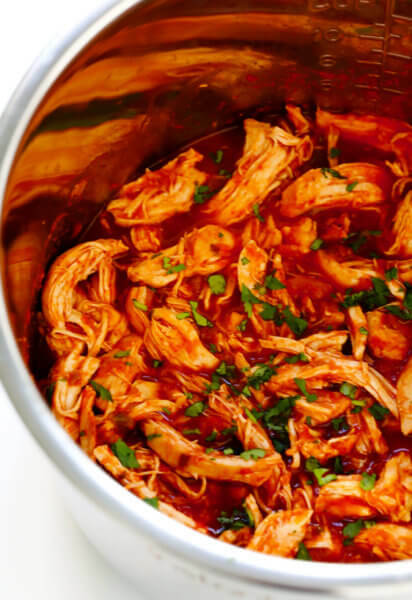 If you want it extra smoky, add in 1-2 chipotles in adobo sauce. If you want it extra fresh and tangy, add in extra lime juice. My husband loves this salsa so much! He heaps praise on me non-stop whenever I make it. I’ve started making large batches and canning them so that we always have it on hand. Thank you! I’m learning how to can and I’m into interested in hearing how you do it. Do you mind sharing? 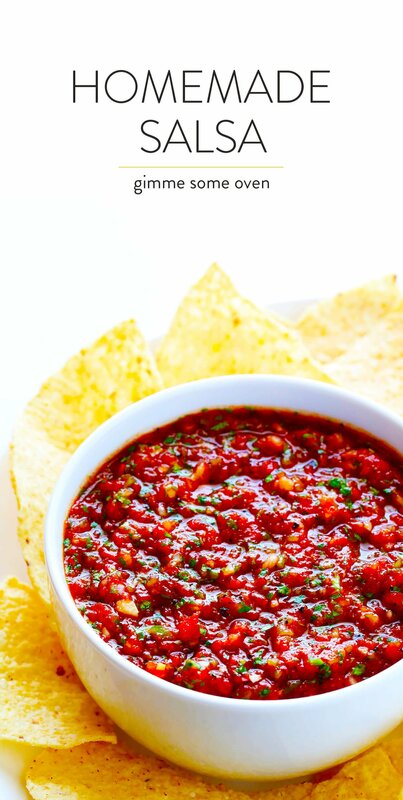 I made this salsa recipe last night and oh my gosh it’s so good! It was my first time making homemade salsa. 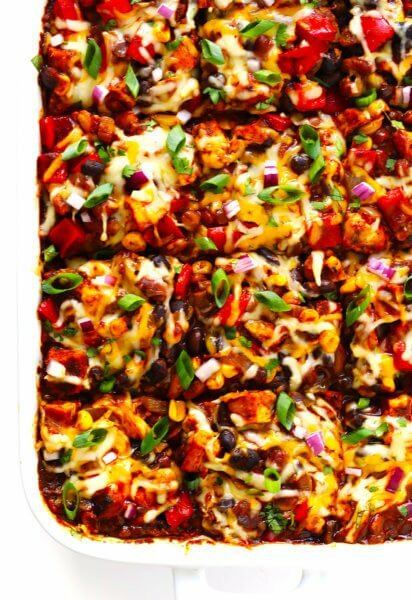 Such an easy and delicious recipe. My husband loved it so much, he almost ate an entire bag of tortilla chips with it! Thank you Ali for this recipe!! My first try at salsa. This was so easy. My husband, whose mom makes homemade salsa all the time, is very picky. He loved this and congratulated me on a yummy successful salsa. Thanks!! 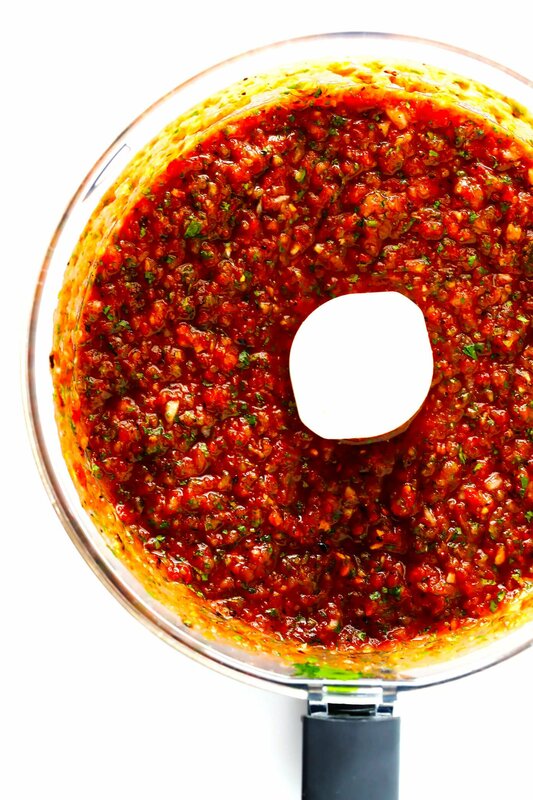 Holy moly this is SO good…never buying salsa again! Just made this salsa last night, we had a taco party and made your Mexican shredded chicken, as well as your classic margaritas! Everything was a major hit, especially the margs! I will definitely be making all three of these things again and again, thanks so much for inspiring such a fun and tasty night for my friends and I! I have made a lot of salsa…fresh home grown tomatoes. BUT this is easy taste better goes faster does not need to meld floors overnite. It is the best. Trust me…i am a salsa queen …now the king. I’m a bit of a salsa snob, and so is my husband. This is a fantastic recipe IMO. I made it with the addition of lime juice. Seriously, perfect! This won’t last long in my house. In fact, I made a batch today for dinner and put a note on it “For Dinner” because I know my teenage daughter will get into and it will be gone!